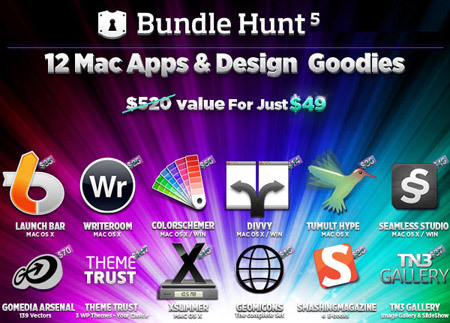 BundleHunt has begun its two week long software bundle sale of some of the hottest apps for Mac OS X / WIN OS and an awesome set of design goodies. The software bundle includes 7 Mac apps and 5 great quality Design resources. The retail value of all the items is over $520, yet the bundle is selling for just $49.99, that’s a 90% discount! The latest bundle is now on offer over the next two weeks and is due to expire at midnight (EST) Sept 22nd, 2011. The applications in the bundle are all latest release versions from the developers. This bundle not only saves you big money on your resources, but could also win you $500 cash as part of the affiliate referral program, so be sure to sign up and recommend it to your friends. LaunchBar Mac OS X (priced at $35) – A smart and powerful, keyboard driven productivity utility that lets you access and control every aspect of your digital life. Whatever you want to get done on your Mac – with LaunchBar it’s only a few keystrokes away. WriteRoom Mac OS X (priced at $25) – A full screen writing environment. Unlike the cluttered word processors you’re used to, WriteRoom lets you just focus on writing. craft, fabric, & design projects. Smashing Magazine e-books (priced at $30) – Included are the latest 4 E-books in Smashingmagazine store: Mastering CSS for Web Developers, Modern Web Design & Development, Professional Workflow Package, Mastering Photoshop, Vol. 2. The 4 e- books are available as PDF, ePUB, Mobipocket. Tumult Hype Mac OS X (priced at $30) – Create beautiful animated and interactive web contact with Tumult Hype! Its HTML5 output works on all modern browsers and mobile devices like iPhones and iPads. No coding required. Xslimmer Mac OS X (priced at $15) – The friendly way to right-size your apps without losing functionality. Xslimmer not only frees space wasted by unused code, it can even increase your Mac’s performance. Geomicons (priced at $16) – Hand Crafted Icons for User Interface Designers. 315 royalty-free vector icons in EPS format, built on a grid and sharing the same visual language. ThemeTrust WordPress themes (priced at $147) – are offering 3 WordPress Themes (3 themes of your Choice) with Standard license. All themes come with custom options and widgets that allow you to make changes with ease. TN3 Gallery (priced at $37) – TN3 Gallery is a full fledged HTML based customizable image gallery with slideshow, transitions and multiple album options. Powered by jQuery. Gomedia Arsenal (priced at $70) – A collection of seven ornate / decorative vector packs (139 vectors in this collection). These have been wildly popular, and now they’re available all at once. Bundle hunt is like a little birthday present for me ahah! i am in the business of business cards. i think these software and designes should be graet on business cards. you seem to have lots of talent. Thanks for sharing Chris ! The bundle looks great – very useful, but it looks like I’ve discovered it a day too late to get the offer!